Any time I've ever seen other people's ultrasound photos, they always just look like gray fuzzy blobs to me. I had heard that when you're in there seeing your own baby moving on the screen, it's a lot clearer...not so much, at least for Steve and me on Tuesday. The technician did say Baby was lying in a difficult position to take good photos (spine up). We did get to see the heart beating, which was neat, but otherwise it was hard to see what she was talking about as she pointed out different body parts. (She turned the screen away from us and was able to identify gender, but we definitely want to be surprised!) Anyway, at the end, she pulled out the 3D wand to get better pictures of the face, and that was MUCH better than the regular 2D view. The baby was being pretty stubborn (though as Steve's and my child, this baby has practically no chance of NOT being stubborn). Apparently he or she was napping and didn't care to move around for us. The technician was not all that gentle as she pushed and jiggled my stomach, trying to get the baby to move around--she even had me fake coughing--all to no avail. I was disappointed as I had hoped to be able to see the movements I have been feeling! But apparently it was naptime and Baby didn't want to be bothered :) To those of you who know Steve or me well--does this sound familiar?? This photo is my favorite--it makes me laugh because it screams, "I am Amy's child!" 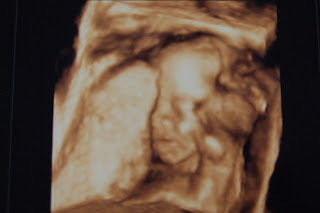 Baby has an arm across the face and is making an angry face--because he or she is SLEEPING and the ultrasound technician won't stop poking. I can just imagine him or her thinking, "LEAVE ME ALONE! I don't want to wake up!" All of you who have ever tried to wake me in the morning are laughing and shaking your heads right now. Since the baby wouldn't move around for us, most of the photos are pretty similar (minus the angry face)--just up-close shots of the left side of the face, with the left arm across part of it. In the one on the right, you can see that the mouth is slightly open--lips were moving and the tech said Baby was probably drinking amniotic fluid. Crazy! He or she weighs about three-quarters of a pound at this point, halfway through the pregnancy. I can't believe it's half over already! How exciting! That is exactly how David was with his 20 week ultrasound- we actually had to go back and have another one so that they could identify the parts on his face. He had his arms in front of it the whole time. But our little girl showed us everything. Aren't ultrasounds great? 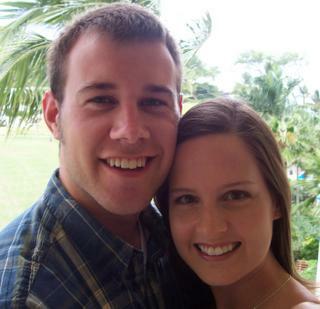 It is so much fun to see our kids before they are born. The new ultrasounds are cool-looking. The last picture is my favorite the others looked mostly bloby to me but I could really make out the face in the last one (after looking at it for a couple of minutes). It's SO amazing!! 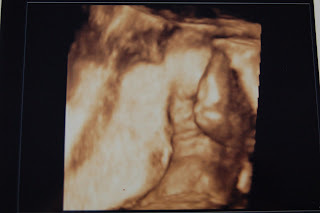 And how cool that you got a 3D ultrasound!! We had a 2D ultrasound at 41 weeks with our second and got some amazing pictures of her...that was cool. It's so funny to me that y'all are saying these photos still just look like blobs! I am the first one to admit when I think it does--the 2-D photos we got aren't even worth posting. One says "FACE" but neither Steve nor I can even begin to identify a face in it. But in all of these, the face totally jumps right out at me. It is unmistakable. I guess maybe because I know how to look at it? Maybe it's like those 3-D images, where you can stare and stare and stare, and not see anything, but once you learn how to "get it," you can glance at the picture and see the 3-D image instantly. ...If this helps: the face is pretty much smack in the center of every photo. You're looking at the left side of the face, as though it's leaning against something, so you can only see one eye, the nose, and the mouth. The left arm is on the right side of the photos (but you can only tell it's an arm in photo #2), and the placenta/uterine wall is on the left side of the photos. In the second photo you can't even see the eye, but the lips look really big. I pretty much can't identify anything around the face, but the face is pretty clear if you know where/how to look. Maybe it's like those 3-D images, where you can stare and stare and stare, and not see anything, but once you learn how to "get it," you can glance at the picture and see the 3-D image instantly. I've gone back and looked again. It's also easier to see on the enlarged photo. Aw, how sweet is this! They didn't have 3D when my olders were in utero. I wasn't aware of it 5.5 years ago either carrying Joel. But I can definitely see a little face. To me it looks like a boy. Congratulations! Somehow you got deleted off my bloglines, and I just realized it, so I'm behind on your news! So sweet. I can see the images perfectly...although with all of my kids I have had a ton of ultrasounds. I think they are easier to see when moving. Did you get a DVD of it? 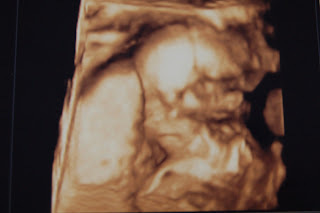 They put their hands up near their face and ears during the ultrasound because it is the loudest noise they will hear while in the womb...heard that on a National Geographic special In The Womb. Your baby is adorable. How far along are you now.